Triggers. They are everywhere. We can try to avoid them, but they will keep on popping up like weeds in your yard that you pullout year after year and they keep on coming. Having lived for more than half my life with triggers that remind me of my daughter lost to adoption, I've stopped trying to pretend that I can avoid them. I just go with the flow. With that in mind I look forward to watching This Is Us, NBC's breakaway hit that has an adoption reunion in one of its subplots. For most of the season, it has been THE story line dominating the series. It centers around a biological father found by his adult son (Randall, played by Sterling K. Brown), an adoptive mother (Rebecca played by Mandy Moore) who knew who the father (William, Ron Cephas Jones) was all along but never shared that information--with anyone, even her husband. Randall's biological mother had died years earlier, and is not part of the plot. Randall's early insistence that he only wanted to see his father's face once--and ask why he was given up--morphs into a relationship. William moves in with Randall's family. The writing covers the initial adoptee reluctance hiding a desire for a relationship; having to tell Randall's young daughter's that William is their grandfather; Randall's rightful anger at his adoptive mother for not telling him about William in the 30-some years she could have. William has terminal cancer by the time we meet him, and in a beautifully done episode last week, dies with his son at his side. By this time, William has been totally rehabiltated as a person. His lover calls to tell the son something wonderful William did for a young addict trying to break his habit. The postman tears up when he hears William has died, as they had a lot of conversations on William's walk around the middle-class neighborhood. Last night's episode had the memorial service. "I really thought I was doing the right thing for you. I really did. I haven't said this before --I need to now, okay? "When I first met him he was so far gone, Randall, and then when I saw him years later, he was so much better...and I got scared. I always planned on telling you. I did. I would set an age in my mind. I'd say, when he is fifteen, and then fifteen would come and go, and I'd lose my nerve. And I would decide on sixteen. Because the truth is I was so terrified because I knew it would devastate you. "It was such a big lie. And such a long lie. I knew that I could lose you over it. I couldn't lose you, Randall. I couldn't. "But that is no excuse. It was selfish. and it was wrong and I want you to know from the bottom of my heart that I am so sorry that you didn't have more time together." Randall listens stoically, and replies: "It was enough time to know that I loved him and I know that he loved me." And then he tells Rebecca that he loves her. Other than this colossal lie, she has been a good mother. I wept last night and in watching it again today, I couldn't get through that scene without tears again. You know I am a regular weeper, but at the same time I had tears in my eyes, I was also cheering that this story--this central story of adoption reality--is a hit on prime time. It's not just our select circle watching--a whole lot of others are too. The general public was confronted with issues they haven't thought about before. Somewhere out there a legislator or two was also watching. So were adoptive parents hiding secrets. Adopted people afraid to talk about "it" with their adoptive parents. Adoptees who want to search, or ask their adoptive parents if they have a shred of information, but do not do so because of fear. Here on This Is Us, they are all seeing their how characters resolve the numerous knotty issues in adoption. Adoption is not the only plot line on the show--also explored are the relationship between the biolgoical twins and Randall; fat issues, as the female of the trio is obese; and the white brother trying to make the break from acting in a TV sitcom to the stage. Perhaps because it is not only about adoption, the show appeals to such a wide audience. Stories like this in the mainstream bring the adoption plight to the forefront of people's attention, and beathe energy into the movement to unseal the birth records. Books, movies, TV shows, magazine pieces and newspaper stories all propel us forward. So, yeah, This Is Us is loaded with triggers for us. The same is true of Long Lost Family, which I record every week and watch later, never without tears, for the emotional impact of reunion is that powerful. I haven't seen the show----my tv left with my former husband five years ago and I never felt the need to replace it. Although I have 'heard' about it from some well meaning relatives who are duly enthralled with it, I'm hardly a credible critic. My take away from reading the dialog you posted is that yes, the natural father was reintroduced to the adoptee's life and yes, the AP was remorseful and expressed her 'fear' that she might have lost the child if she'd told sooner. Good (to a degree) that the tv world will witness this. But--(forgive me) how convenient is it that the natural mother was already dead and the natural father quickly followed suit. Is it easier to say I 'should have told you' when it's clear that there will be no emotional loyalty issues and awkward "sharing" of holidays and family events going forward-- now that he "knows"? It might be one reason it appeals to such a wide audience...who might have bristled at witnessing the fallout and struggles of integrating families long separated due to forced adoption secrecy. You know that many (no,not all) of them wish us dead anyway. Other than the "colossal lie" exposing her feelings of despicable entitlement, she was a good mother? I would think that everything she did would have been tainted by that one position. Honestly, the only adoptive parents I trust are the ones who fight their worst fears from the get-go and work their butts off to ensure that "their" chosen children have unrestricted access to birth information--and we all know they are very, very few and extremely far between. I'm going to take a leap here to say that there are probably loads of AP's with hidden information regarding the birth families. If this tv show can turn the tide on their line of thinking that would be great. But, until and unless they deal with the legislative process to change the laws...the wheels of justice for adoptees will slog along at a snails pace. Earth Mother, My take away from the dialogue is on the same train as yours. I think that many can only swallow reality in adoption in small controlled doses, so at least this is a step in a forward direction. Funny isn't it. We had to accept the realities of losing our children all in one swell foop! Like a hawk on rabbit. Yes, Earth Mother, I think that last sentence really says it - "until they deal with the legislative process to change the laws...the wheels of justice for adoptees will slog along at a snails pace." How very true. As a birth-mother, I must admire your bravery in admitting your mistake. I salute you. 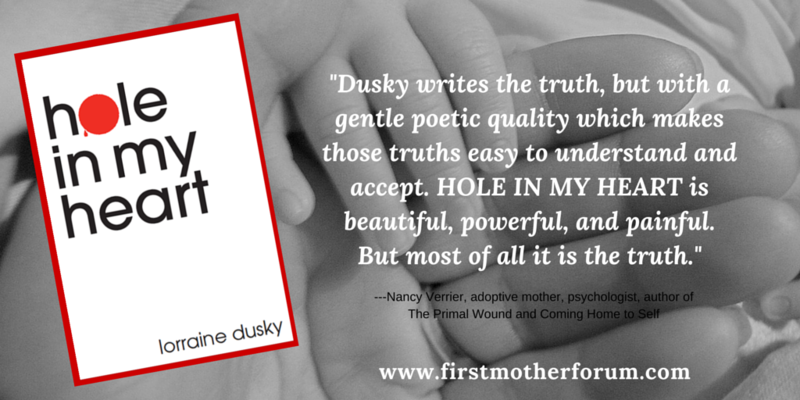 I made mistakes too, in trying to connect with my birth-daughter, but then we are human and our hearts are on the line. I love forums like this where we can share honestly, and encourage each other in such bumpy and heart-wrenching situations. This is by far one of the best shows I've seen in a long time. It has a large following which is good because it hits on so many important issues. Its easy to get attached to all of these characters. The adoption scenes are done so well I just fell in love with the character of William(Randalls biological father). From an earlier episode, Rebecca(amom) runs out on William when she realizes he wants a relationship with his son, she left him crying and heart-broken. During this last episode, right before Rebecca begins to apologize to Randall(adoptee) she starts the conversation with, "You know your father (pause)...Jack(adad)I mean, he taught you a lot about honesty & courage, but the truth is you came into this world pretty perfect. You always had this gentleness, this inner kindness from the start & I think you get that from William(bdad)." Rebecca had to acknowledge that he wasn't a blank slate, he already had William's demeanor when he was born. I thought that was important because she acknowledged Randalls Identity. A tweet I read said, 'Just as Jack(adad)lives on in Kevin(biological twin), William lives on in Randall'. Tears. This show is worth watching, but have lots of kleenex. Totally agree with you, Sandy. I forgot that part, her acknowledgment that Randall was not a blank slate. I thought the whole adoption stuff over the course of the eight or nine shows was handled honestly, and the acting and writing was so good that you felt like you knew these people. I think "This is Us" is an excellent illuminator of the fall-out from adoption, what adoption creates. My son Lenny is a LOT like Randall. I am really happy this show has a large following, and I hope it influences a large number of people to revisit the narrow notion of just "getting a baby," without considering the long-term implications for that baby. I have put in long nights at work of late, but I never miss an episode of "This is Us!" I hope shows such as this one eventually bring widespread acknowledgement of the emotional devastation wreaked by adoption. What's going to happen? Randall announced at the end of the show last night that he wanted to adopt....will the writers teach people how to do it right? Will it be an open adoption? How will the writers handle that? So far so good, so maybe we can hope?